Ok, so I like food and I happen to eat a lot of it (you know to survive). Also since I do own a food-type business, I for some reason get asked about my favorite restaurants in the area quite frequently. Therefore I figured I’d make a list of my absolute favorite restaurants, dessert places, and the best deals I’ve found on food around the Dayton, Cincinnati, and Columbus area. I put this on this list, because I frequent this place so much it’s not even funny. It’s close to work and for some reason even though I tell myself not to, I end up there. Great place to hang out with friends and they have a really nice draft selection there. My favorite? Kentucky Bourbon Barrel Ale. They also serve pretty good Pub fare if you’re hungry, Fish & Chips, Shepard’s Pie, and various other bar foods. It’s not my top choice for their food, but the environment more than makes up for it. I think I survived on this through college. Classic, fairly cheap Vietnamese fare. You really can’t go wrong with a hot, steamy bowl of Pho on a cold day. Definitely the best Vietnamese restaurant in the Dayton area. My only dissatisfaction is with the consistency of the place. Sometimes their food is absolutely delicious, and other times I leave the restaurant feeling like the food was missing something. Nevertheless, a great place for a quick meal. I also frequent this place a lot. However, I go because of the incredible Happy Hour specials that they have. They have appetizers starting at $1.95 to $4.95, and not just some dinky little appetizers, these are legitimate large fill-you up kind of meals. I always order their generous plate of steamed mussels and fish tacos. It’s seriously cheaper than going to Chipotle. Which brings me to…. People also ask me what the best Chinese restaurant is around the Dayton area (presumably because I’m Chinese) and I always say Tsao’s Cuisine. Yes there are other Chinese restaurants in the area that are quite good (like China Cottage), but the only place you can get the most authentic Chinese food is at Tsao’s Cuisine. Their head chef there cooks like the most awesomest Chinese Tiger Mom ever and her food is always excellent. Be sure to order off the Chinese menu there and don’t worry there are pictures next to the Chinese words (Heck, I had to go by the pictures too). If you even dare order sweet and sour chicken at Tsao’s, I will cry a little (on the inside). Hands down one of the best Mediterranean restaurants in the area. Really generous portions at a great value. Their Gyro’s are excellent, as well as their Specials where you get your choice of meats along with a Greek salad and other side dishes. They also hand-make one of the best ginger ales I’ve ever had. They had to make this list right? Nothing can beat going to Bill’s at odd hours in the morning and getting some delicious cheap donuts and some milk. That’s what makes it so great, they are always open for whenever your craving strikes. So there are several places here in Dayton that serve great Thai food, Choe’s Asian Gourmet in the Greene, Thai Smile in Huber Heights, and Bahn Mai Thai Cafe in Centerville. However Thai 9 is still always the place I go when my taste buds are in need of some Thai Cuisine. The main reason is because they carry fish cakes on their appetizer menu which are my absolute favorite. Lightly battered and chewy they come with this delicious dipping sauce that’s just making my mouth water as I type this, a MUST order. The only thing I advice against ordering is their sushi which I think is overpriced for the portions made. Which brings me finally too…. Hands down, THE BEST sushi restaurant in Dayton and I can honestly say that they can compete with just about any sushi restaurant anywhere within their price range. All the sushi chefs are originally from Sushi Cafe in Centerville which was where I got my sushi fix for years. Within the past 2 years they all moved to this new restaurant and I followed them. I always order the exact same thing, a Red Fire Roll, Tuna Hand Roll, and their Squid Salad. Completely satisfied every single time. A must try, if you haven’t been. ~ That’s my list for my favorite Dayton food spots. I will add-on to this list with spots from other cities in subsequent posts. On to some Yoba news. We introduced Passion Fruit (a summer flavor that we just never got around to fully debut) almost 2 weeks ago and it’s honestly been getting some mixed responses. I personally love Passion Fruit and if you remember from a post awhile back, Passion Fruit juice is my absolute favorite. However I can see why there may be people who won’t like it since it has a very strong aroma. Anyways, it won’t be on our active roster for much longer so give it a try next time you visit us. We recommend mixing it with some dark chocolate or even another yogurt flavor if you feel it’s aroma is too overwhelming. Halloween is coming up and I do not have a costume ready. Any good ideas? The Bengals are 4-2? I would not have expected this and I’m not going to say anymore for fear of jinxing. One more Bengal note, Carson Palmer to the Raiders for a 2012 First Round and a conditional 2013 First Round Pick? What a great trade turning an unusable and unneeded player into such an asset. Major Props. Remember my fantasy team was 0 – 3 last time I posted? Well I’m a much more respectable 3 – 3 now, again not going to jinx myself. I’ve told you about one of my favorite shows ever in Mad Men, however I’ve got another new one now. Breaking Bad on AMC is amazing. I’ve been watching on Netflix for the past few weeks and absolutely can not get enough. Bryan Cranston (from Malcolm in the Middle and Seinfeld) is phenomenal in it. It centers around a High School Chemistry teacher with lung cancer who decides to cook crystal meth to further support his treatments and his family. Check it out if you get the chance. Subsequent posts will include more ‘Recommendations from a Foodie’, posts about fashion and great deals I’ve found, a feature about http://www.buyyoung.com/ which support companies start by people under the age of 30, and more! As a relatively new small business owner, I have come to realize and appreciate the camaraderie that I now share with other fellow small business owners. Over these past few months I have met many and we always share our stories, the highs and the lows, and come to appreciate each other’s hard work and business concepts. It can be very inspiring and also very humbling to meet people who just have this powerful drive to operate a successful business and it just pushes me to make the most of my opportunity here at Yoba as well. Now, I have realized that during our conversations that we always talk about how hard it is to compete with larger more established competitors. Now please before I go any further, don’t assume I’m against big business and that buying local is the only way to go. I feel competition in the market is what makes the United States such a great place as it is. Should I buy an Amazon Kindle or a Barnes & Noble Nook, what is better value for my hard earned money? Do I want some Starbucks today, or maybe a McDonald’s coffee will satisfy my caffeine cravings for the day. I believe that the more choices available to the consumer, the better the economy can function. Saying that, I also can now understand how difficult it is for a small business owner to compete in these scenarios too. You might all be wondering now why I’m even writing about this in my blog so let me explain. Recently on a fashion blog called Commerce with a Conscience (which highlights clothes that are made environmentally friendly), the blogger introduced a new line of men’s chinos and shirts from Unis, a small, young company specializing in men’s wear by up and coming designer Eunice Lee. To highlight how small this design firm is, they only have one retail store in NYC while wholesaling some of their products to about 25 other retail establishments. Now to highlight how expensive her products are, a pair of her chinos costs around $228, while her shirts can cost upwards to $100. What become suddenly interesting on this blog however was when a reader named Jason, commented on the post asking why her chinos cost so much? He said that although he understood that the pants are hand-sewn in New York, he doesn’t understand why they cost so much more than a pair of Dockers or Bill’s Khakis. His argument summed up to why the average consumer should buy this particular product over any other’s that are offered especially when it seems that $228 could do more spent another way. Well lo and behold, Eunice Lee herself decided to respond to the commenter just a few hours later on the blog and what she had to say I believe made me understand the plight of small business owners everywhere much better. She begins by explaining how small her company is with just one retail location while wholesaling to 25 boutiques around the nation. Comparably Bill’s Khakis has over 500 store locations across the United States. Just looking at it from a 3rd party perspective, I think you can understand the immediate disadvantage she is operating at. Secondly, she begins to describe the manufacturing industry here in the United States which is almost non-existent. Our minimum wage here in the US is one of the highest in the world (not saying that’s bad thing) and there are so few manufacturing facilities left to use. Even if she mass produced 5000 pairs of pants, the cost is the cost and there won’t be much of a discount because of it. She even had to move some of her production out to LA, because manufacturing in NYC has just become too expensive. Why did this all happen? Well it’s easy; it’s you, the customer that made this all happen. We have all decided to buy cheaper and all the companies have listened. There’s a reason why Forever 21, H&M, and all of the other stylish low-cost retailers have been successful, everyone has chosen to buy cheaper, thus all of the production has been moved overseas to cut costs. This leaves so few manufacturing facilities In the US, which makes it extremely difficult for independent designers to negotiate their prices. She even states that it would much cheaper for her to manufacture in say China for the same type of quality you would get here in the US. This however defeats the purpose of her goal to have her clothes designed and made in America. She is extremely strong advocate in promoting local business growth and to bringing manufacturing back in to the states. Eunice goes on to ask how much the actual cost for a pair of $60 chinos would be at a store such as J. Crew or Gap. Very likely it landed in the US and shipped to store for just $13, that’s fabric, trim, wash, dye, cut, and sew. Her chinos on the other hand are all made with top quality fabric from Italy, designed by a very small staff, with the general overhead of operating a small business is the reason why her Chinos can cost $228. She didn’t specify this, but I’m assuming her profit margins at $228 are very similar to the profit margins at J. Crew which really it just astounding if you really think about it. She went on to thank Jason for his comments and gifted him a free pair of her $228 chinos. I have a newfound respect for Unis, and one day if I can, plan on spending some of my hard earned money on her products. I just found this to be an extremely interesting conversation between a customer and the retailer that you won’t be able to find anywhere else. This comes full circle to all small business owners across the country including me here at Yoba Frozen Yogurt. We are an extremely small company (if you can even say company) with just me and a handful of employees trying our best to serve a quality product. It is also very hard for me to compete with more well-known and established competitors. Like I said in my previous post, buying our ingredients can be more expensive because I can’t rely on food service companies for many of my products. They require me to buy in such large bulk that it’s just not realistic for me to fulfill the purchasing commitments. These little things all add up to my overall overhead and reduce my profit margins. Also a very exciting development to show off as well. A friend of mine, Nishan, who works for WHIO-TV and also owns Digi Pics, designed and filmed a promotional video for me as well. He did an absolutely amazing job and I can not thank him enough for all the work that he did. Unfortunately I can’t upload the video to this blog for some reason, but will try to do so later. In the mean time you can check the video out on our Facebook Page at http://www.facebook.com/YobaFrozenYogurt. That’s all for this post, I actually had this one finished late last week but we’re having some internet issues at the store and I just haven’t got around uploading this post until now. If you’re out and about The Greene this weekend and haven’t been to the store yet, come in and check us out! Free sample are always available to try as well. 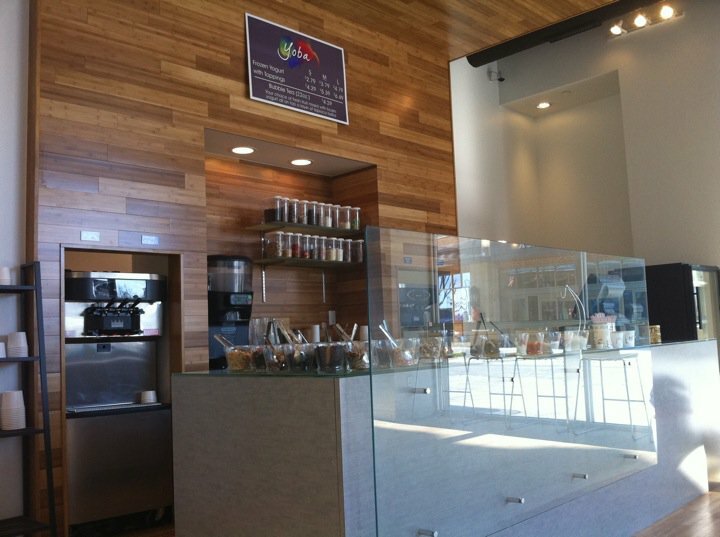 Also read our reviews on Yelp at http://www.yelp.com/biz/yoba-frozen-yogurt-dayton. I will update this more a little later. Just want to get this post published. Thanks! Yes, I know, it’s been 2 months since my last post which is just far too long for this blog. However I have my (poor, very, very poor) excuses which you will slowly find out as you read through this post. Also, since I’m just really unsure on how to begin or what to even write about since so much has happened these last few months I’m just going to let my fingers start clicking and see what we end up with at the end. Let’s start with a little bit of the business side of things here first. It’s finally spring, although the weather really hasn’t improved all that much sans a few warm days here and there. To celebrate we introduced two new flavors in the middle of last week, Blueberry Acai and Mandarin Orange, which replaced our Peach Mango and Raspberry Pomegranate flavors. Now to answer a lot of the questions about if the old flavors will ever make a return, yes they will! We know that each flavor has its contingency of fans and we work so hard to develop them that we can’t retire them indefinitely. They will be back along with an array of new flavors that we are always working on. I personally really love our two new flavors with the Blueberry Acai having that extra tart kick and the Mandarin Orange tasting extremely refreshing. I would love to hear your opinions on our new flavors and we’re always open to suggestions of any new flavors that you would like to see. Also this past week we made a new menu board that introduces our new ‘mini’ size as well as emphasizing our smoothie line. We have received numerous (and I really mean numerous) requests to have a smaller size than our small and I think our ‘mini’ size fills that void and it has been very popular especially if you just want that little taste of yogurt to settle that craving for Yoba. Our new menu also highlights the delicious smoothies that we make. Originally, it was advertised as a bubble tea and either 1) people didn’t know what a bubble tea was or 2) they were disappointed that it was a smoothie and not an authentic bubble tea or ‘nai cha’ in Chinese. Let me go into a little detail on how our version of bubble tea came into play. As a kid, my parents would take us up to Chicago routinely for weekend getaways and being that we are Chinese, of course Chinatown was always a necessary stop during our trip. Well tucked in a little corner of the shopping complex in Chinatown was this bubble tea shop called Joy Yee’s. What they specialized were bubble tea smoothies with real fresh (and I mean really fresh) fruit smoothies with tapioca boba layered on the bottom. They were delicious and it was always a real treat to get one during the dreaded 5 hour romps shopping through Chinatown. You could get these smoothies in any sort of fruit and they had everything and it was always, always fresh! I still vividly remember my mom or dad handing me my order and thoroughly enjoying every sip. However I think these childhood memories also ruined my experience in just about any other bubble tea shop in the USA. I have noticed that the majority of bubble tea shops use an artificial powdered substance to enhance their bubble teas. Ask yourself this the next time you order a Taro, Lychee, or any other exotic bubble tea. How in the world can they get these products fresh and how in the world are they making it into teas and not smoothies? Very likely their buying these powdered mixes from some website like BobaTeaDirect, mixing it with some water, sweetener, adding the important boba and selling it for $3.75. You can get recipes like that all over the internet. So when I decided to open up Yoba Frozen Yogurt, I knew we had to have a fresh bubble tea smoothie on the menu and resist from using anything artificial. Using my experiences from Joy-Yee’s as an inspiration and putting our own spin on it, we decided to let the customer dictate the experience. You choose your favorite flavor of our signature frozen yogurt and your favorite fresh fruits and we’ll do everything else. It’s delicious, healthy, and just a refreshing treat. If you’re not a big fan of the tapioca boba, get your smoothie without it, it’s your drink and we can make it however you want. I still constantly get questions from some of our regulars and huge bubble tea aficionados if we will ever be serving a real milk bubble tea. I will always say yes it is possible that one day we will add that to the menu. However what I won’t do is add something to the menu that is not of quality and that I personally will not eat on a regular basis. I pride myself over the fact that everything coming out of Yoba is of the absolute best quality. For example, I go shopping for fruit several times a week purchasing only the best of the selections and we never have more than a few days worth of fruit inventory at any time. Its practices like these that I hope can equate to the customers that we care and our proud about every single product that we are serving. May we eventually carry a milk bubble tea? Yes, but only when we are able to make one that first of all tastes great, and secondly we can make efficiently and with only the best of products available. It just has to be something that we will be proud to serve. Ok, enough of the business side of things, it’s been awhile and I’m assuming everyone wants to know what’s been up with me (just nod your head. thanks.) Well my last update was February 1st, so let’s start from there. Finally took a weekend off during the middle of February to go up to Chicago with my girlfriend to celebrate her birthday. Of course we had to make a stop (or two) at Joy-Yee’s for some dinner and bubble tea. Also did some shopping and caught a comedy show as well. However my mind was still forever attached to what was going on at the store and of course the weekend that I leave happens to be the busiest weekend we had to that point. My employees were absolutely wonderful and when I got back on Sunday, everything was in good shape. Otherwise, the majority of my life is still being situated here at Yoba Frozen Yogurt. My employees have been picking up the slack for me as I have been able to have a day or two off every now and then which is just a luxury that I didn’t appreciate just a year ago. Actually I thought this part of the post would be pretty long as well, until I realized I don’t have much else going on in my life. Just not a lot of time for a social life these past few months and each week is just flying by. Looking forward to finally getting into spring season as I had this date marked on my calendar a year ago. I think this is the end of this post, as always I will say that I will try to update on a weekly basis, but as you might know now that is sometimes an empty statement. Again, if you haven’t checked out Yoba Frozen Yogurt and want to read other peoples insight about the store check out our yelp reviews at http://www.yelp.com/biz/yoba-frozen-yogurt-dayton. Also we have our Facebook Page at http://www.facebook.com/YobaFrozenYogurt which you can check out for more up to date information. Speaking of Joy Yee’s. They are not tucked into some corner anymore, over the past few years that have grown incredibly in Chicago and have opened numerous restaurants all over. I recommend you try them all especially one that is called Joy Yee Plus Shabu Shabu, a hot pot restaurant. Absolutely wonderful. Red’s opening day today. Looks like a good team all around, although I worry about Scott Rolen lasting through the whole season and some of the shoulder injuries on the pitching staff. It’s Jay Bruce’s year though. Wow, Butler in the Final Four again. Even though I’m a Wright State alum, I have to give Butler their credit. Unbelievable team and an amazing coach in Brad Stevens. Parmida Home Concepts is opening across from us this Saturday, April 2nd. Big grand opening celebration and their store looks very nice. Joya’s Bistro adjacent to us is also opening next week on April 6th. Been looking forward to their store opening for a long time now. Since I spend so much of my time here at Yoba Frozen Yogurt twiddling my thumbs you would think that I would get to update this blog a little more often. Alas I don’t, because I might be one of the biggest procrastinators ever created. I also spend a lot of my time on this new website called Facebook. To fill you in on this new phenomenon, Facebook is an effective tool to use in order to stalk unassuming friends as well as creating a virtual social network in which you will never ever be in need of real human connection ever again! Replacing my real friends are instead these pictures of them filled with whimsical quotations and awards which are handed out for effective farming techniques and mafia assassinations. Seriously though, imagine if you could travel back in time 10 years (I heard the technology will be available in 2015 via a flying Delorean) and were to explain to your past-self how you would spend a considerable portion of your day on a social networking website reading status updates of inane observations from your friends. I would seriously look at my present self and question my future man-hood while quickly learning how to code internet things. Wow, what a weird way to start this blog after almost a month of negligence. If you are all reading from somewhere here in the mid-west, I assume that the title of this blog post makes some sense as it seriously looks like Superman’s Fortress of Solitude outside (you know, the one from Superman II, the movie). With the weather like it is, I figured this was as good a time as any to hammer out another Pulitzer winning post from yours truly (as I hope you can tell, I’m also feeling even more sarcastic today than usual). January here at Yoba Frozen Yogurt has finished off well and my confidence level has increased significantly since my first post of the year. I just have to keep reminding myself that this is a marathon race and not to look at it as a 100m sprint. But enough about the business, it’s boring to write about sometimes and I assume even more dull to read. Since I do spend alot of the time here at Yoba by myself, it’s been a great time to catch up on some reading that I have been putting aside. So since I just finished a book today, I thought I would write a book review. Now, a year and a half ago I decided to run the USAF half-marathon here in Dayton, OH. This was my first long-distance run besides several 5k’s that I happen to do a few times a year (at most). While training with my friend Joel, who is an avid marathon runner, told me to pick up a book called “Born to Run”, a non-fiction about an indigenous tribe in Mexico called the Tarahumara who are lauded for their super-human long-distance running feats. A collection of ridiculous runners in 280 pages of inspiration. The author, Christopher McDougall, starts off the book with a simple question. Why does my feet hurt? This hit me right from the start, because it is the same question I ask myself every time I lace up my pair of running shoes. It usually is just a matter of time during my training when some part of my body tells me to stop. McDougall does an excellent job weaving in a story about a mysterious American by the name of Caballo Blanco living with the Tarahumara and organizing a 50 mile race between some of the world’s best ultra-marathoners against the best of the the Tarahumara. Within this story, McDougall expertly fills the pages with antidotes of sports science, on how humans are genetically natural-born runners, how running shoes are a curse to the modern runner, and how the diets’ of the Tarahumara fuel their endurance and the evidence behind it. Throw in a collection of stories on Scott Jurek, the Jordan of ultra-marathoners, as well as other world-class athletes, and if you’re not blown away with inspiration then your’re either Scott Jurek or just really hard to impress. I’ve got a few other books here stashed away that I have been needing to catch up on. I might do some of these book reviews every now and then but probably only if they really blow me away. I just need some more ideas to inspire me to update this blog more frequently. I might also try to update this blog more frequently with some shorter posts and pictures in between these long posts. Speaking of pictures, I think it be nice if this blog included some. So below is just a picture of our counter and back wall. I think if I can scrounge up all the pictures that I have, I will have a blog post consisting of before and after pictures of our store. Finally as usual, if you want to know more about our concept you can ‘like’ our Facebook page at http://www.facebook.com/pages/Yoba-Frozen-Yogurt/117673521617757 as well as read our reviews or review us at http://www.yelp.com/biz/yoba-frozen-yogurt-dayton. My friend Joel, I believe also wrote a little review of “Born to Run” on his blog which I linked to previously. So basically if you’re an avid runner or just interested in what the human body is possible of, read the book! Super Bowl this Sunday. Whose you’re pick? I’m going with the Green Bay Packers. With the youth and skill of this team and Aaron Rodgers leading this way, the Packers are going to be compete for a couple more Super Bowls after this one too. Anyone eat-out during Dayton’s Restaurant Week last week? 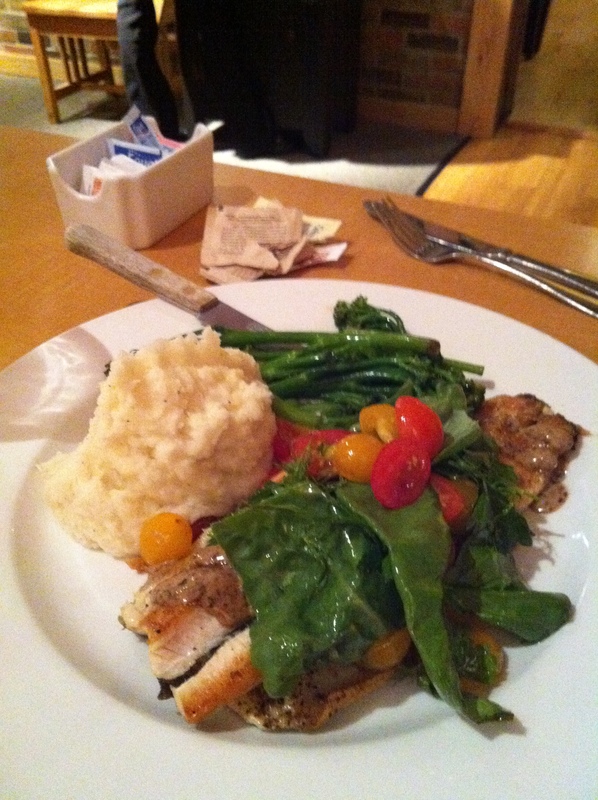 I only had time to go to Carver’s Steak & Chops which was delicious as usual. Definitely a lot of great local Dayton flavors that participated and I hope go to a few more next time around.